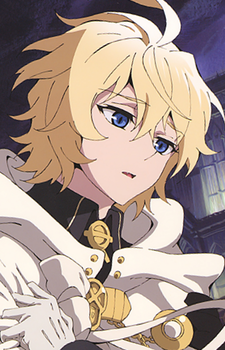 Is the deuteragonist of the Owari no Seraph series. He is an incomplete vampire and a servant of Third Progenitor Krul Tepes. He was human until Krul Tepes bit herself and shoved her tongue down his throat. He, along with Yuuichirou Hyakuya, possesses the "Seraph" gene, which is relevant to the forbidden taboo and the focal point of the story, "Seraph of the End." He wields a red colored sword. When he orders it to drink his blood, it sprouts thorny vines that pierce his hand. His strength grows in proportion to the amount of his blood the sword drinks.